The recent discovery by a TAU-led team of a fossilized human jawbone in an Israeli cave has led to a new dating for the earliest modern human to be found outside of Africa. Based on scientific analysis in TAU labs, the fossil was estimated to be between 177,000 and 194,000 years old, pushing back by about 100,000 years the time that Homo sapiens was first believed to have ventured out of Africa. This astounding discovery was made by physical anthropologists at TAU’s Dan David Center for Human Evolution and Biohistory. The Center, which is part of the Sackler Faculty of Medicine and of the Steinhardt Museum of Natural History, Israel Center for Biodiversity Studies, houses TAU’s unique Biological Anthropology Collection of specimens dating back 1.5 million years. The Collection, which is housed at the Steinhardt Museum, offers scientists boundless opportunities to investigate all stages of the historical, biological and cultural development of humankind, enabling them to paint a detailed picture of ancient life in spheres ranging from demography, migration, health and diet, to the division of labor, religious beliefs or ancestral cult, and much more. The Center is a dynamic hub for state-of-the-art research that could have implications not only for understanding human evolution but also for enhancing human health in modern times. The Center honors the memory and legacy of major TAU benefactor Dan David, an inventor, businessman, philanthropist, and a seeker of knowledge. David was fascinated by how the past informs the present and the future, as reflected in the annual Dan David Prize, which he founded and is administered by TAU. he also donated the Dan David Classroom Building on campus, as well as scholarships for management students. Addressing Gabriela and Ariel David, Prof. Klafter said, “You believed in this project when it was still a sketch on a piece of paper, and when this museum was still a pile of sand. Beyond your commitment to the David Center, you have both been pillars of support for Tel Aviv University for many years, and in many ways. It is hard to imagine this university without Dan David, but it’s just as difficult to imagine TAU without Gabi and Ariel,” said Prof. Klafter. “We are proud that Tel Aviv University, the Steinhardt Museum and the Dan David Center will play an important and central role in educating Israeli children about human evolution,” he added. Dean of the Sackler Faculty of Medicine Prof. Ehud Grossman paid tribute to the founding members of the field of physical anthropology at Tel Aviv University. “These pioneers paved the way for us to amass the one of the largest and most important fossil collections of biological anthropology in the world,” he said. He welcomed the new young faculty members from the Sackler Faculty of Medicine who are affiliated with the Center: Dr. Hila May, head of the Laboratory for Bio-History and Evolutionary Medicine, Department of Anatomy and Anthropology, and Dr. Rachel Sarig of the Department of Oral Biology and Orthodontics of the Goldschleger School of Dental Medicine. Prof. Tamar Dayan, Chair of the Steinhardt Natural History Museum said, “In 2012 the future of biological anthropology in Israel looked bleak. Now, today, with the inauguration of this Center, we are celebrating success,” she said. “The joint efforts of the Dan David Foundation, TAU and the Steinhardt Museum are bearing magnificent fruit – with two new outstanding faculty members in the Faculty of Medicine, a new storage facility, state-of-the-art preparation laboratory and advanced scientific equipment, and a very beautiful new exhibition to portray the biological and cultural evolution of humankind. 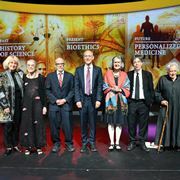 I am sure that Dan would have been happy and proud that his family has played such a pivotal role in ensuring that both science and society will gain ever deeper insight into the history of humankind,” she concluded. In his response, Mr. Ariel David thanked all those at TAU involved in making the project a reality, including Prof. Klafter; Amos Elad, Vice President for Resource Development; Prof. Israel Hershkovitz; and Prof. Tamar Dayan. “All these people have been dedicated to this project from the beginning,” he said. Head of the Center Prof. Israel Hershkovitz gave an overview of the history of physical anthropology in Israel, paying tribute to pioneers in the field including TAU Prof. (emer.) Baruch Arensburg of the Sackler Faculty of Medicine, a major expert in the field, who was present at the ceremony. Hershkovitz noted that the Center comprises over 1,200 sq. meters of space for storing, researching and exhibiting TAU’s Biological fossil Collection, which comprises unique specimens gathered from throughout the Levant over 80 years. “It is the only collection in the world to provide a continuous record of all those who passed through the region in the past 1.5 million years – from Homo erectus, Homo heidelbergensis and Neanderthal, through to anatomically modern humans,” he noted. 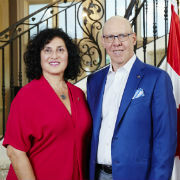 Hershkovitz recalled his first meeting with Dan David in 2003, when Dan asked to accompany him on an anthropological dig. “Since that tour, Dan became a champion of my research – as friend, dig participant and benefactor. His generous support enabled numerous breakthroughs, including important discoveries at the Qesem, Misliyah and Manot Caves, among others,” he said. The ceremony concluded with a fascinating presentation on “Teeth as a Time Capsule” given by Dr. Rachel Sarig, who explained the importance of teeth in the field of physical anthropology. Also present were TAU Rector Yaron Oz; Director-General Gady Frank; Director of the Steinhardt Museum Alon Sapan; Deputy Chairperson of the Board of Governors Dame Shirley Porter; TAU Governor and Global Campaign Cabinet Member Sylvan Adams and his wife, Margaret; and leading paleontologists from TAU and other institutions in Israel. 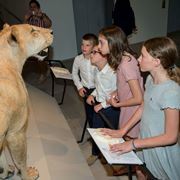 The ceremony ended with a plaque unveiling at the Center, located on the 4th floor of the Museum, as well as a tour of the exhibit, “What Makes Us Human?” The exhibit presents a series of presentations through which the observer can follow the major milestones – physical and cognitive – in human evolution.